A classic sweet recipe simple with no complex ingredients, just cook the carrots in milk, add sugar and garnish with nuts and ghee. That’s it, perfect to celebrate a sweet occasion.Well what’s the occasion? This is my 200th Post! In spite of blogging for almost 3 and 1/2 years, I just now managed to reach the 200th post.Yeah really!! I have seen many recipes with milk maid and khoya, I had no stock of both, so cooked in milk as I reduced the milk and made this. Milk quantity can be reduced. I love carrot halwa, I never know it is made really tasty with the red carrots, here in Singapore, we get these red carrots fresh in Mustafa during winters. I have heard many people saying it turns out best in taste when made with these red carrots known as halwa carrots. So picked up for the first time and tried. So here is the full video, updated for you all with red carrots. In the video, I have doubled the quantity. Though the video is short, it took a lot of time, since large quantity. But really worth it as I am a great fan of this. Add milk, pinch of salt and bring to boil. Cook in medium flame. Make sure to stir every now and then, especially after the milk thickens. Otherwise it may get stuck to bottom of pan. After milk thickens, it will not over flow, so can keep the flame in high, but you have to keep stirring, otherwise it will be stuck to bottom and easily get burnt. Cook till all the milk reduces almost and the carrot gets cooked . When the mixture starts thickening,add ghee little by little. Add powdered cardamom and mix. When the halwa is thick and starts leaving the sides of pan, switch off the flame. Add cashews and pistachios fried in ghee and mix well. Only the grating part is a tiring job. So you can try using a food processor for this grating job. You can first heat ghee, fry the nuts and keep aside. And then proceed with the first step. You can add badam too. I have added a pinch of salt, but you can skip it too. When I made in small quantity, it was very easy to make, but when I made in larger quantity as in video, it took lot of time. You can reduce milk or ghee, no hard and fast rules. Choose big enough vessel, especially when making in large quantity. Because while getting cooked, it splutters a lot. Use lid to cover and be safe. congrats on your 200th post. Gajar ka halwa looks delicious. This is so lovely.. Adore your clicks…Classy presentation..
it looks beautiful and scrumptious!…I love it warm with icecream…lovely presentation! Congrats on your milestone Raji! 🙂 Wish you many more of them in future. Halwa looks colourful and the presentation makes more rich! Also, congratulations on your 200th post. raks,congrats! beautiful click n yummy halwa…nice presentation…. Congratulations on your 200th post. Halwa looks classic, btw you can add khova at the end of the preparation to make it more rich. Who is the other person in the family??? any good news? STunning pics as always! Congrats on your 200th post Raks – they have been 200 delicious ones! Wow, how inviting! so colorful! Congrats Raji. Awesome clicks. Makes me want to reach out. I love the bowl very much ofcourse what is inside it too. Kolladhe ennai Kolladhe , am gng to sing this song … Raks, Aweeeeeeesome.. ..Have it with Icecream , real heaven..
Divine divine..OMG pls pss the pan to me..looks awesome ..
Congrats on your 200th post raji…halwa is looking perfect for the occasion. Very traditional presentation. Congrats on your 200th post.Nice picture. Congrats on reaching the 200 mark. Lovely pictures and lovely halwa! Wish u many more centuries like dis,but quicker century this time hah?? very apt for d celebration..!! Congrats on the 200th post. wishing you many more 100s here. My eyes are on the serving bowl. Congrats on your 200th post!! Gajar ka Halwa looks really delicious. Really cute serving bowl. Congrats on ur 200th post Raji,wishing u more and more centuries like this..Halwa looks irresistible and fabulous..
Congrats on ur 200th post dear…. Amazing clicks look so very eyecatching.Looks delicious. 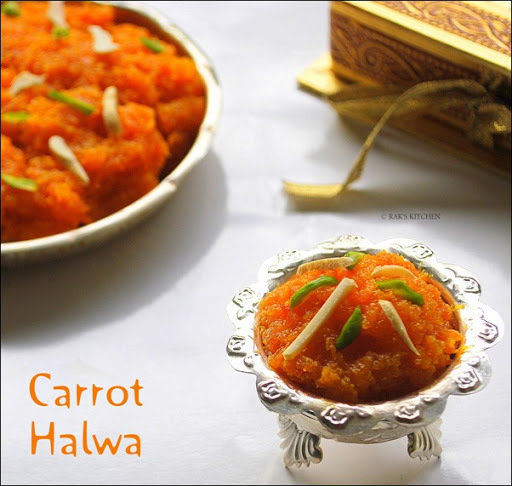 congrats on ur 200th post and carrot halwa is a perfect way to celebrate the occasion too. Very bright colur and all i need is a bowl of carrot halwa and a scoop of vanila icecream…. ove the way u presented it. Congrats on ur post and best wishes for more recipes here. Perfect clicks, I like the bowl. Congrats on ur 200th post & wish u good luck for many more such wonderful posts….This halwa is the perfect sweet to mark this milestone!! congrats on your 200th post… whenever i would like to try for a new dish, first i come your blog and check ur recipes….. thanks for sharing all your wonderful recipes…. 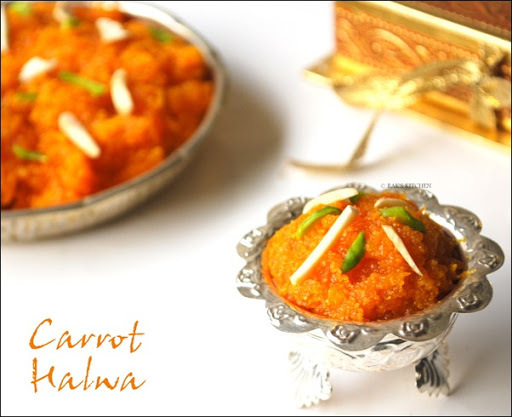 let your work continues for ever…..
and the carrot halwa looks so beautiful…. Congrats! Halwa looks so so inviting..
mm..pass me that bowl..looks so beautiful..can't keep my eyes off that..wonderful..wish you many more posts like this one..
வாழ்த்துகள் ராஜி…இன்னும் நிறைய குறிப்புகள் கொடுக்க வாழ்த்துகள்..
Hey Rajeswari, it's the quality that matters and you've been doing a wonderful job- congrats!! As for the gajar halwa, all I can say is WOW! congrads on 200! great going.. The site still stand so proud and with heads up.. kudos to a great work! halwa is soooo drool worthy. love that small kadai also..
Congrads on 2nd century! halwa nalla irukku! Hit more centuries…. Congrats on u r 200th post :-). carrot halwa looks delicious..
Congrats Raks, I am yet to reach there. I am very slow in posting. Halwa looks very very delicious and yes the processor helps a lot in grating. It just grates in a minute and I use it when making in large quantities. Just peeling the skin is the hard part. One of my friend suggested scrubbing the carrots with a scrubber and grating with the skin. I have not done it but it seemed to be an easy option. Congratulation! My favorite halwa looks delicious. The pictures look so divine Raks. Congrat on your milestone! Congrats on ur milestone! The picture are gorgeous! congrats on your 200th post…May u achieve many more..perfect recipe to celebrate..looks tempting & great presentation! Ohh Raks, Love Carrot Halwa!!! !this is sweet of our family!!!! Cute bowl!!!! You have an award waiting in my blog. Congratulations … Raks on your 200th post.. This Gajar ka Halwa looks fab 🙂 Wot a lovely way to present it !! Hmmmmmmmmmmmm yummmmy………… looking delicious.. tastes very good when topped up a scoop of vanilla flavoured icecream. Halwa makes me drool a lot!!! Congrats on ur 200th post…Lovely presentation and looks delicious!! Wow!! The pictures makes me drool…Lovely recipe for a 200th post. a classy dessert to celebrate 200th post. Lovely presentation. Hmm yummy dessert.There is an award for u in my blog come and grab it. congrats on ur 2nd century! !…colourful halwa !! congrats on ur 200th and may I say that all 200 have been super great! Very different from the other versions of making it with condensed milk, mawa or link powder!! Different from the other versions of making this with condensed milk and mawa! !Thank you! Nice recipe. one more suggestion, grating carrot is difficult so keep carrots in microwave for 4 minutes then grate… it becomes easy n simple!!! Tried this recipe and it turned out great. Thanks for sharing this wonderful recipe. But one thing i noted was it takes quite a long time to do right despite of the fact that the recipe is simple..i thought the carrot gets cooked in the milk and milk evaporation part would be quickly done..But that part takes almost all the time..So whomever wants to try this, i might suggest, first check whether you have sufficient time and gas..But its worth giving a try..
Again thankyou so much for the recipe..
Hi… I prepared the dish same way as above. But i dont gt good red caroots here. My halwa looks white in colour. What can i do to gt nice colour? taste is yumm.. bt colour..
hey this is really nice.my friend n i just tried really too yummy…! By mistake i added more sugar in this and halwa became very sweet.What can i do now? Please give me some tips to reduce the extra sweetness. No idea, may be bread crumbs will help? I tried it today and it came out so well. Thank you very much for the recipe. Came out very well, thank u for the recipe 🙂 where do we add the salt? Can we use condensed milk in place of sugar? If yes, how much should we use? My name is Raji 🙂 So next time follow her instruction and fry little more time until raw smell goes off. Shelf life of the halwa Raji? ?